Britain's oldest working standard gauge steam locomotive. Photo © Sydney Leleux, gratefully used with permission. The Furness Railway Trust is delighted to announce that we have been donated a former Furness Railway steam engine. Originally Furness Railway Number 25, a younger sister of FR20, like FR20 it transferred to the Barrow steelworks, becoming BHSCo Number 17, and like FR20 was then saved on retirement in 1960. 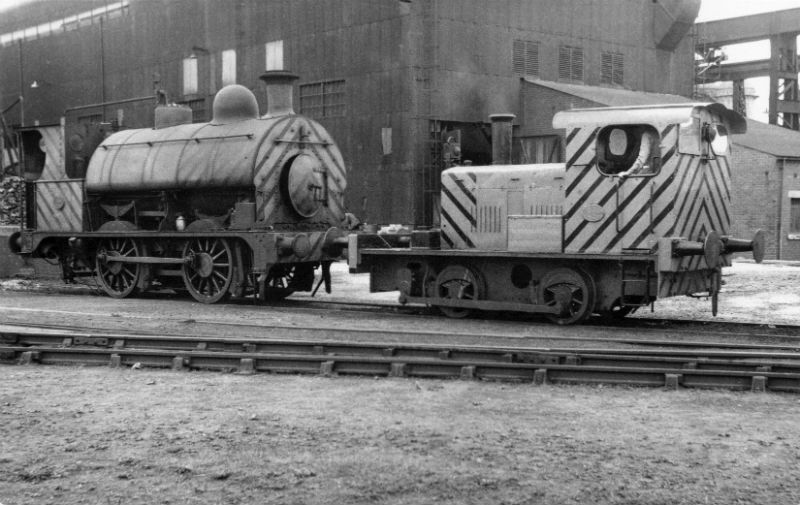 It is our hope to continue the previous owner's efforts and return the loco to steam in its BHSCo guise as seen in this 1959 picture with FRT stablemate Fluff. Our Austerity saddletank Cumbria has moved to join our GWR "Taffy Tank" 5643 at the Embsay and Bolton Abbey Railway in the Yorkshire Dales. And FR Number 20 has returned to our base in Preston after 9 years as operational locomotive in residence at Locomotion, the National Railway Museum at Shildon, County Durham, as it nears the end of its current ten year boiler certificate. Work will begin on its second heavy general overhaul in preservation later this year. Welcome to the award-winning official website for the Furness Railway Trust. For the latest on what we - and our locomotives and carriages - have been up to, visit our weekly blog. We are also on Twitter and Facebook. The FRT owns Britain's oldest working standard gauge steam locomotive, Furness Railway Number 20, 20's younger sister BHSCo Number 17, GWR duo 0-6-2T 5643 and 4979 Wootton Hall, Austerity Cumbria, and Barrow steelworks shunter Fluff as wel as our vintage train. We have our engineering base in Preston at the Ribble Steam Railway but our locomotives and carriages are found at heritage railway sites nationwide. We are a Charitable Incorporated Organisation. Our fund-raising and your support keeps us going. Why not Gift Aid a donation?! Try the Search Engine, the Site Map, or our guide to navigating the site. Colours used are original to the Furness Railway Company paint scheme. Website designed to be viewed at 800 x 600 resolution. You can get in touch via this website.